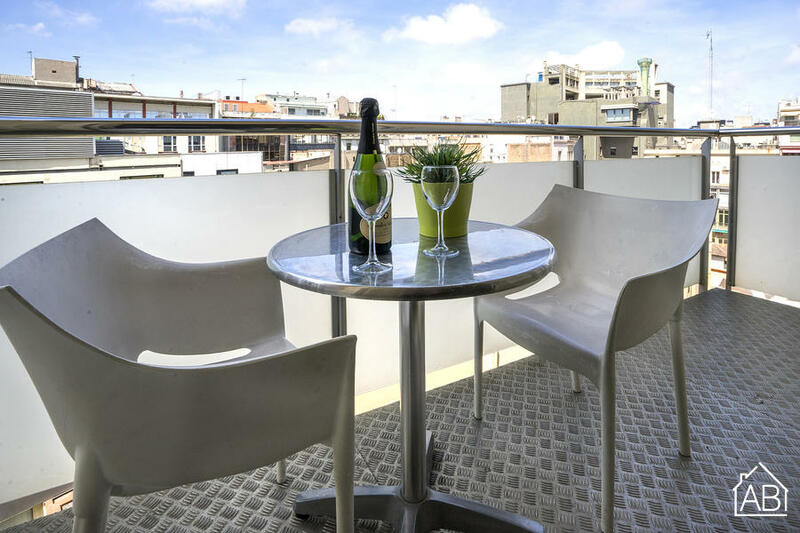 This luxurious two-bedroom apartment in Barcelona, located near Plaça Catalunya and right next to Passeig de Gràcia, is the ideal base for those looking to explore everything the Catalan capital has to offer. By choosing this apartment, visitors will find themselves in the heart of the city, with easy access to the historic downtown and all of the popular sights in Barcelona. With bars, clubs and hundreds of restaurants right on the doorstep of the apartment, you won´t need to go far to enjoy all that Barcelona has to offer. A holiday stay at this convenient accommodation will make your adventures in the city easy to plan. This stylish apartment is decorated with modern furniture which is seated on classic parquet flooring. The living room of this fantastic apartment has French windows which open up onto the balcony, which allows for lots of natural light in the apartment. You’ll also find a comfortable double sofa bed/divan and a TV here, making it a great place to relax after a long day of sightseeing. The kitchen is fully equipped, perfect for trying some Mediterranean inspired dishes! This magnificent apartment has two bedrooms and two bathrooms, the master bedroom comes with a double bed and ample storage space, and the other bedroom comes with two single beds. Both bedrooms have a fresh and elegant style. Both of the bathrooms are very luxurious in look and style, finished in white marble and complete with fresh towels ready for use upon arrival. One of the bathrooms has a bathtub. Complete with many modern conveniences, such as Internet connection, heating and air conditioning, this apartment has everything you need to make you feel at home in Barcelona.